The French Connection in Chiang Mai! The Chiang Mai Municipality along with 7 private organizations signed an agreement to completely get rid of garbage in the city on March 24 at the Central Airport Plaza. The Municipality signed the agreement with the Businesswomen and Occupations Association of Thailand, Chiang Mai Branch, Central Chiang Mai Airport Plaza, Kad Suan Kaew shopping center and hotel complex, Siam Commercial Bank, Urban Development Institute Foundation, Pakee Khon Hug Chiang Mai and Rimping Supermarket. 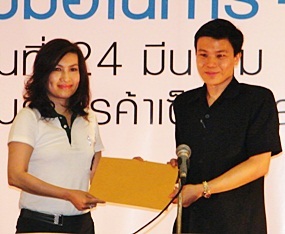 Artchaawan Limlenglert, left, the president of Businesswomen and Occupations Association, Chiang Mai branch, as a representative of the 7 private organizers presented the signed cooperation agreement to Mayor Taasanai Buranupakorn, right. Mayor Tassanai Buranupakorn added that the new cooperation among the government and private sector will help to reduce the rubbish problem in Chiang Mai. There will be educational campaigns to encourage people to throw their rubbish away rather than burn it, as well as rubbish bins will be placed around the city’s corners and in 10 communities around the city. Each Saturday, Municipal Garbage trucks will collect the rubbish. Additionally, there will be bins for plant and food material so that the City will produce compost from leaves and other produce. More than 24 schools in the municipal area have set up their recycling banks, with separate garbage collection systems for each type of refuse. The first one opened for the public at the Three King Monument, from 9.00 a.m. – 12 p.m., the second one will be at Tha Pae gate, and the third one will be set up at Changpuak gate. Mayor Tassanai said if individual or organization would like to join in the city development and help keep the city clean and tidy, to call the Call Center, Tel. 086 – 4296647 to 9. Michael K. Morrow, U.S. Consul General and Andrew Veprek, Consular Chief of the U.S Consulate here in Chiang Mai attended the Chiang Mai Expats Club meeting at the Shangri La Hotel on Saturday, March 27 to answer questions and let American citizens know some important upcoming changes. 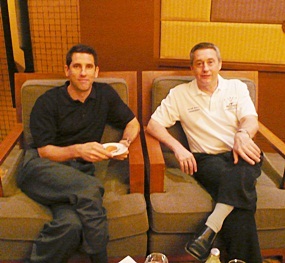 US Consul General Michael K. Morrow joins Alan Hall of the Chiang Mai Expats Club at the meeting at the Shangri La on March 27. Mr. Morrow talked to the crowd about the role of the Consulate in Chiang Mai, stressing its primary mission is to serve the growing American community in the North. There are currently around 7,500 American citizens living in the 15 Northern provinces served by the Consulate. Additionally, tourists are also helped when they lose a passport, encounter difficulties or accidents or death. The Consulate also has 9 Drug Enforcement Agency representatives who work closely with the Office of Narcotics Control Bureau (ONCB) and the National Security Bureau (NSB) in fighting drug trafficking in Thailand. He said from the 70’s and 80’s when Thailand was one of the biggest heroin producers in the world, it now produces “virtually no illicit drugs whatsoever” and he praised the role of the Thai government in fighting drug production. However, Thailand remains a major transit point for drugs coming out of Myanmar and Laos and they continue to maintain vigilance in those areas. In fact, he added that in the first two months of the year more than 6 million yabaa pills were seized in Thailand. Additionally, the U.S. Consulate works to support Burmese human rights activists adding that the U.S. is a major destination country for the resettlement with around 10,000 Burmese and Hill tribes being resettled in the United States in the past decade. One of Mr. Morrow’s prime goals is to increase American investment in the I.T. economy in the North, noting that the government has realized it needs to diversify the economy in the North. The recent Creative Economy Conference was a huge success and IBM has recently opened an office in Chiang Mai. Environmental concerns, deforestation and water issues remain a concern but additionally, public diplomacy is a key issue for the Consulate. Exchanging views, with educational and cultural exchanges taking place. Finally, he announced the Fourth of July party will be organized by the V.F.W branch here in Chiang Mai and will be held Sunday the 4th at the Municipal Stadium. U.S. Consular Chief Andrew Veprek made some very important announcements regarding American citizen’s services fees. Within a month, fees for notarial services are expected to rise to $50 and an $82 fee for additional passport pages will be instituted. Additionally pages are currently free. He encouraged everyone to get this done if needed. Stressing that an appointment must be made online to have pages added. You can visit the Chiang Mai Consulate website and click on American Services at http:// chiangmai.usconsulate.gov. Additionally, the cost of a new passport will go from $75 to $135. He noted, however, that every passport issued out of the Consulate is the business size passport that holds additional pages. The Consulate will be closed Songkhran week. However, Friday April 9 the Consulate will be open for drop in visits from 8 AM to 11 AM. He encouraged citizens to register with the Consulate in order to receive warden messages, warnings and in case of emergencies it allows for family to be contacted for instructions. He also noted that there are no IRS services at the Consulate and there will be no visits from the IRS for taxpayer assistance. Tuesdays and Thursdays are available for American Citizen’s services appointments and Mondays and Wednesdays are set for Visa services. Be sure to make an appointment before going. 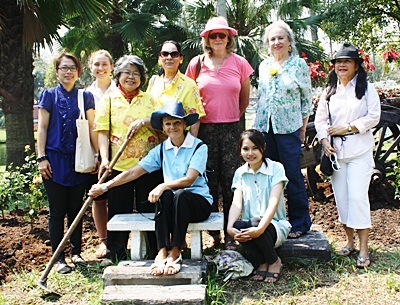 On March 8, 2010, Laura Godtfredsen, president of Zonta Chiang Mai International celebrated International Women’s day by planting yellow roses in honor of women around the world at Zonta Rose Day. President elect, Jiamjit Boonsom, past president, Hope Watcharaprecha and Zontian Celeste Tolibas-Holland each planted a flower bush in honor of women fighting for various causes including health, legal rights and education. The newest rose garden is in Chiang Mai City Park, planted among other bushes to celebrate in past years. Through Zonta’s efforts to help and celebrate many advances for women worldwide, there is a growing awareness to the global needs and equality for all. Come enjoy the new lives of the yellow rose bushes, and remember each of them stand for different advances for women that have been achieved. The Consulate-General of Japan in Chiang Mai, together with Negibose Thailand Co., Ltd., a Bangkok-based Japanese manga (cartoon) distributor, is organising the “Mobile Japanese Animation Cinema” Project, which offers the chance for Thai children in remote villages to enjoy Japanese animation films on the big screen. This year, the project is aimed mainly at children from hill tribes in Chiang Rai province. The project screened the film. Ruam Jaim Tumoane, Doi Sa Ngo and Saen Jai in Chiang Rai Province on the 25, 26th and 27th of March. “Sergeant Frog (Keroro Gunso) Movie 2: The Deep Sea Princess”, a comedy that follows the attempts of a platoon of frog-like alien invaders to conquer Earth was shown shown on the big screen.. The project is supported by the tambon administrative organisation of each host tambon and Rose Media & Entertainment, the copyright holder of the film in Thailand. Any tambon administrative organisation or school that is willing to host a future event under this project is requested to contact the Consulate-General of Japan by phone at 053-203367 (Ext. 104) or by e-mail at [email protected] tttmaxnet.com. Musically speaking, this has been a week where the French connection has really come to life in Chiang Mai. On Friday March 19th in the music salon at the home of the Murase family, the Friends of the Chiang Mai Music Festival celebrated the 200th anniversary of the birth of Chopin with a dazzling performance of his 24 Preludes played by the inspiring and delightful Japanese pianist Yoko Kakishita. Miss Kakishita was on true professional form – she opened her recital with the Chopin Fantasy in F minor where she captured with great passion the contrasts between the more somber F minor passages and the radiant major passages. The Preludes, played without a break but with a slight pause between sections, are a great challenge to any pianist – Miss Kakishita showed from the very start that she had a total understanding of the changing moods and of the different nuances that each Prelude possesses. The Prelude No 7, a Polish mazurka, was given a noble and impressive interpretation; Prelude No 13 showed Miss Kakishita’s great ability to convey the endearing and delicate nature of the intoxicating melody, contrasting superbly with Prelude No 18 which was bursting with energy, the arpeggios coming across with startling force and panache. This was truly a most memorable performance from a superstar in the making and it was played to a capacity audience who were rapturous in their praise for this dynamic young artiste. Contrasting somewhat with this was the performance of three pieces by Gabriel Faure at the Saisuree Hall at Payap University on Saturday March 20th. Visiting professor and conductor Dr Henri Pompidor from Mahidol University had gathered together a large ensemble of instrumentalists and impressive choir, all from the Duriyasilp College of Music within Payap University. Together and under his strictly controlled baton, the good-sized audience were treated to three pieces – Faure’s well known and much loved Pavane, followed by a lesser known youthful work, Cantique de Jean Racine and concluded with a full performance of the celebrated Requiem. Horns harp, electron, flute and strings formed the ensemble and the fifty-strong choir in immaculate dress provided a delightful backdrop. Throughout, the singing was wonderful and the two soloists in the Requiem coped extremely well with their respective parts which demand a great range of notes and large contrasts in tone. The ensemble generally played well, despite the often poorer tone quality of the violins. Nevertheless it was a wonderful opportunity to hear these works and to relish the beautiful and haunting moments captured so eloquently in the Requiem, notably the Sanctus, Pie Jesu and the In Paradisum, repeated as an encore. Chiang Mai has a great deal to offer the public in musical terms and both these concerts did great justice to these two contrasting French composers. Santi Saengthong, aged just over 40, is a calm reflective man who has accomplished a great deal in his life so far, and to the great benefit of the Chiang Mai musical community and beyond. Santi began life in Phitsanulok where, after finishing high school, he went on to study English and linguistics at Naresuan University in that city. As he was transferring from school to University, Santi discovered what was to become the first love of his life, music. He began a little earlier at age 13 studying electric organ, but four years later took piano lessons and became far more serious-minded about his learning. After graduating from Naresuan University in 1990, Santi came to Chiang Mai and settled into a further linguistics course at Payap University. However, the course at Payap was quite unsuitable for his needs so he transferred his energy and skills to pursuing a career in music, a move that has resulted in the development of an attractive and vibrant Music School being established close to Kad Suan Keow. Santi Saengthong brings music to Chiang Mai students, offering his passionate belief in talent to everyone he meets. 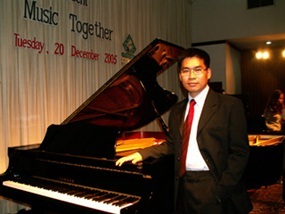 Santi made the decision to quit Payap after considering his options – he had reached a reasonably high standard in his music making and while at Phitsanulok, had already organized two highly successful chamber recitals. Building on that initiative and using his considerable enterprising skills, he initially set up the Santi Music Studio with a view to helping other like-minded music lovers pursue their careers in this field. Fortunately for the Chiang Mai community, the enterprise was successful and four years ago, the now locally famous Santi School of Music was founded with his business partner Khun Nusara Limpatchanakul and it has gone from strength to strength. Every week some 130 or so students undertake lessons and associated studies there, with about 13 teachers, many of them part-time, working away in practice rooms and small recital rooms. Santi himself has a huge schedule of work – not only is he full-time in his own school teaching piano and acoustic skills, he also works two days a week at Prem Tinsulanonda International School in Mae Rim teaching in the music department there. Using his entrepreneurial skills to the full, Santi is not content with just teaching – he draws on those earlier Phitsanulok experiences and organizes many successful public concerts, many of which are charitable events which benefit, among others, those who are blind or students in schools that are poorly endowed with musical instruments. He spares little time for himself – but when he does, he prefers to travel or devote himself to photography. Much of his higher order musical skills are self-taught, but he has enhanced these through sitting public examinations, and on one occasion took himself off to Manchester in the UK where he studied the organ over a two-month period, using that opportunity to expand his musical knowledge by attending as many concerts and recitals as he could fit in! He is a passionate believer in developing the musical talents and strengths of young people and he never fails to promote their music-making for their benefit and for that of the wider community. When asked if he had plans for the future, his response was typical of this dedicated and sincere musician – ‘to build a good sized acoustically decent concert hall for the Chiang Mai community’. But in addition, it is also his dream to expand his school and bring more students under his guidance to learn and to perform so that they too may come to love music as so many others under his tutelage have done already. Probably the biggest single annoyance on the Internet is unsolicited commercial email (UCE), or Spam as it is more commonly known. Spam has been circulating on the Internet since the 80’s, when the Internet wasn’t even publicly available. It is big business, and although illegal in most countries, it is very difficult to prevent, because most of it originates either from countries where the legal system is ineffective, or from “Zombie” PCs, which have been infected with Trojans. There are hundreds of thousands of “zombie” PCs out there and they can be triggered at any time to send millions of emails. It is extremely difficult to stop all Spam, and if you manage to do so, there is a good chance you are stopping some legitimate messages as well. However, there are several techniques you can use to filter out the majority of spam mail, which we will describe below. If you have Microsoft Outlook (2003 or 2007), there is a tool called the Junk Mail Filter. This scans your incoming email for known spam characteristics, and if it finds what it thinks is a spam, it moves it to your Junk Mail folder. You can periodically scan this folder to make sure it hasn’t moved a good message by mistake, and then empty it. This is probably the best way to handle spam. The Junk Mail Filter is free, and updates are provided by the Microsoft Update process described above. Simply search for “Junk Mail” in Microsoft Outlook or Office Help for instructions on how to set up Junk Mail Filter. If you subscribe to an Internet “suite” of products from one of the leading vendors, such as McAfee or Norton, they have their own Spam filtering products which do a similar job. You can normally set the detection level to low, medium or high, and it is your own choice as to how strict you want to be when looking for spam messages. If you use web-based email, such as Hotmail or Yahoo mail, or even a Batelco email account, there are settings you can use to filter Junk Mail in the same way.